A ladies style night fundraiser will take place at the Killashee hotel in Naas on Saturday, April 13. The event is in aid of the Irish Motor Neurone Disease Association. The first 30 people will receive complementary goodie bags, and there will be cheese and wine reception upon entering. 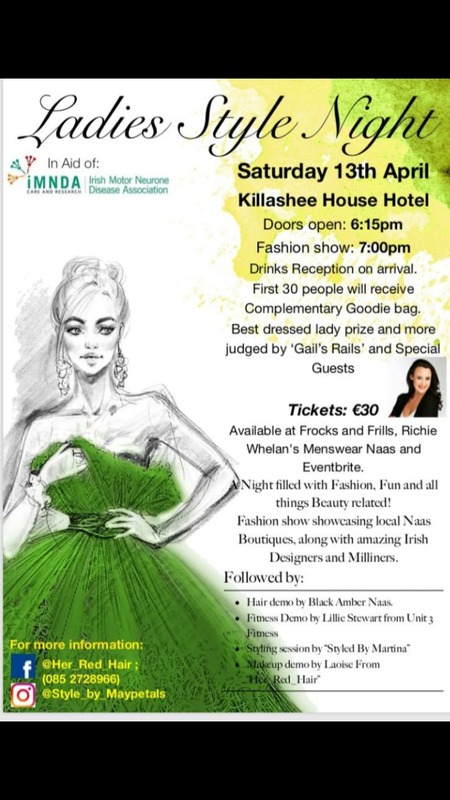 There will be a fashion show starting at 7pm, with some beautiful Naas boutiques involved, along with Phoenix V, Julie Caulfield (who attended the Oscars this year) and an unbelievable amount of support from almost all of Ireland’s top milliners. There will be a number of demo’s on the night including a Styling demo: Styled by Martina; Hair demo by Black Amber Naas; A ftiness demo from Lillie Stewart of Unit 3 in Naas and a Makeup demo. There will be amazing spot prizes on the night, and a special ‘best dressed Lady’ prize judged by Gail Murphy from ‘Gail’s Rails’. Tickets are available on Eventbrite: €30 + booking fee.